Take a look at the Gerber Freescape Hatchet. Created by the American-based company Gerber, this rugged tool is versatile and durable. Its forged steel head has a friction-resistant coating to offer smooth chopping power. The axe head is over-molded into the handle to reduce the possibility of splitting or breaking. A textured grip on the handle keeps the axe from slipping when in use and the reinforced glass-filled handle offers comfort and reliability. The sheath is one of Gerber’s unique designs: a slipcover that wraps around the back of the hatchet and can be stored directly into the handle when not in use. It comes in fluorescent green to match the accenting on the handle. The striking contrast of black against green offers users maximum visibility plus the added bonus of a sleek, tactical appearance. This excellent hatchet delivers a simplistic yet durable design, making it an ideal choice for camping or backpacking trips. The first thing you notice about this hatchet is the color. It is a shocking bright green, which makes it easy to spot and offers a colorful, modern twist to the traditional hatchet. The axe head is made from forged steel rated at HRC 55. It is coated in a low-friction black coating, which gives it a lustrous finish as well as a functional advantage. The black glass filled handle is finished with a textured green grip that offers a lanyard hole at the end. The Gerber logo can be found elegantly embossed on the side of the handle. Another great feature is the blunt back end, which is effective in hammering stakes or nails. Despite being an American company, this particular hatchet is made in Finland. The Gerber website boasts the introduction of the innovative quick-remove matching green sheath that offers a firm plastic slip-on cover with a durable elastic strap that secure around the back of the axe head. I have to say, I am not a fan of this sheath. While it does offer a convenient quick release option, it also seems like it could come loose if it snags on something. There is also limited carry options with this cover. Gerber used to offer another more functional Kydex sheath as well though it is not clear if it is still included with your purchase. However, at a little over two pounds, it can be conveniently situated in a backpack. This is a great camping hatchet for the simplistic outdoorsman. It won’t do much in the way of heavy-duty tasks, but it will certainly tackle your basic campsite duties with ease. 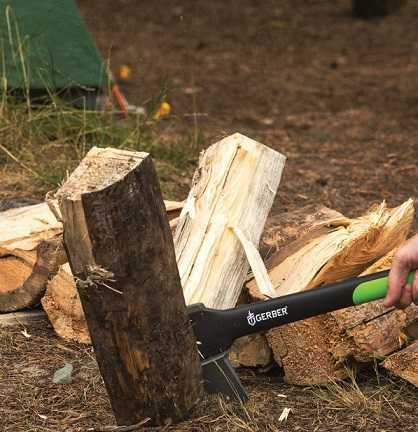 Kindling, chopping branches, building shelter, and chopping up firework can be both fun and simple with the Gerber Freescape Hatchet. Are you looking for a simple tool that will help you conquer all your camping needs effortlessly? Then the Gerber Freescape Hatchet is just what you need. 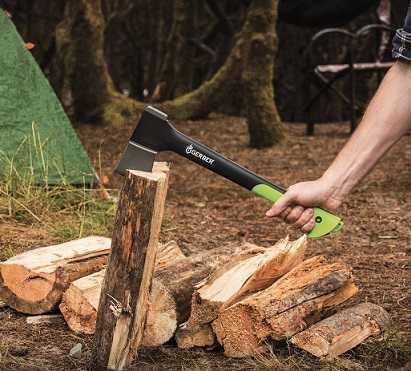 It has everything you need for your basic camping trip: a sharp, resilient axe head, a sturdy, comfortable handle, and a blunt end for breaking down branches or hammering in tent stakes. Plus, it offers you all this in a stylish package. As I mentioned above, I am not a big fan of the sheath, as I think it offers very minimum blade protection and absolutely nothing in the way of carrying options. The Kydex sheath may be useful for attaching to a pack, or hanging on a wall, but it may be too clunky to attach to a belt. At a little over two pounds this axe is not particularly heavy, and thus, can easily be carried in a bag when trekking around the woods. 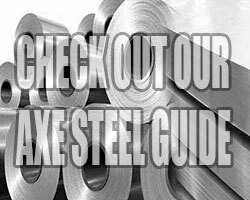 The steel itself is a bit soft but still it’s of decent quality, weighing in at 55HRC and boasting a friction-resistant coating. This makes for solid, sturdy chops and cuts. I recommend the Gerber 17.5-inch hatchet to the novice outdoorsman, or to those who like to keep their pack light and simple.